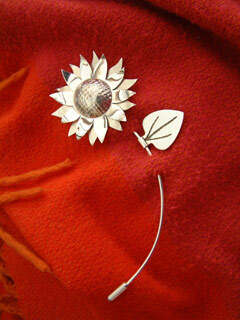 The silver flower was made in 3 parts. The centre is shallow-domed silver textured with coarsely woven fabric. The polished petals below this are soldered in place whereas the circle of frosted petals at the back remain free to rotate. The etched leaf slides up and down the stem to the wearer's preferred position.